CreateSpace is the easiest way to publish a book on Amazon. We will step you through the processes to easily get your book available for sell through the largest online retailer in the world. 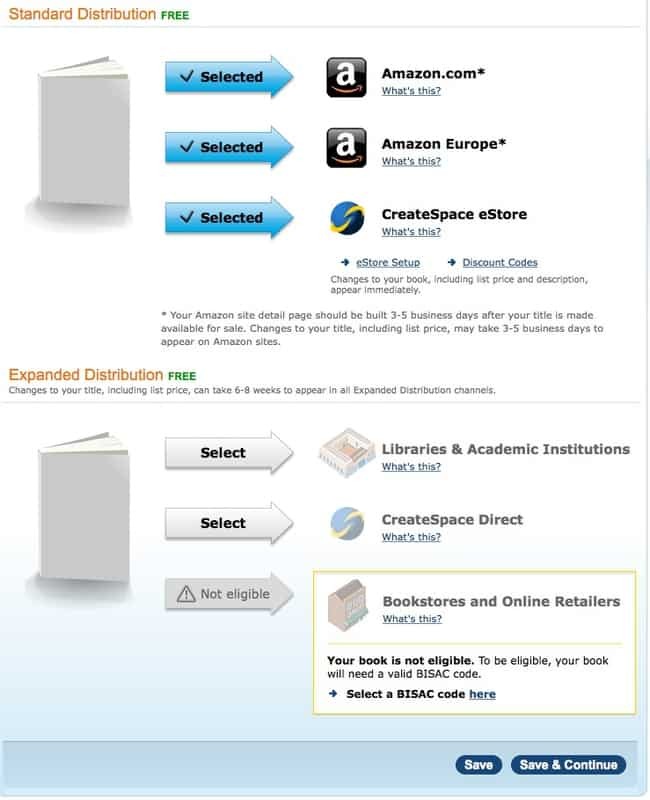 The first step to getting started with CreateSpace is by creating a free account with them. You need an email, password, and full name, along with your country and the type of material you expect to publish. On the next screen you will need to accept their service agreement. They will send you an email for you to confirm your identity. Click on the link there and then choose "Set Up Your Book Now" when prompted to choose between that and "Talk to a Consultant". This will take you directly into adding a new title. To add a new title, click on the "Add New Title" link on the left. Then fill out the form presented. 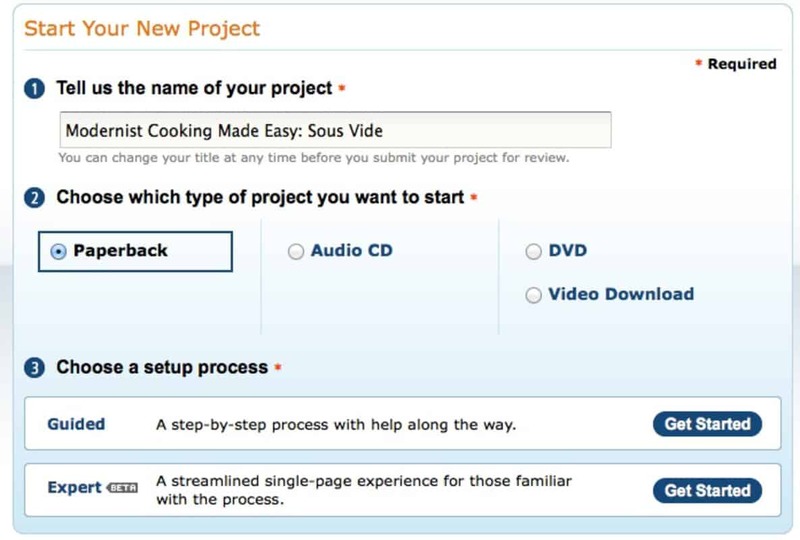 The "Name of Project" will be the title of your book. Choose "Paperback" as your project type. If this is your first time adding a book we recommended choosing the "Guided" setup process. Enter the name of your book and the subtitle. If you have a kindle version, the name and the subtitle you enter should match your kindle version exactly. The primary author is most likely you, unless you are publishing someone else's book. Make sure you enter in the name as you want it to appear throughout Amazon. When you enter your Primary Author name, be very careful to be consistent between books. For a while I had two author pages, one for "Jason Logsdon" and one for "Jason W Logsdon". This made it much harder for people to find and view all of my books and it also led to some confusion among readers. You can also add any contributors that were an integral part of the book creation process. Only add people here if you want them to get credit on your Amazon sales page, right next to your name. If your book is part of a series then you should add the series title and edition number. If your book is in a language other than English, be sure to select it here. This allows you to set a specific publication date for your book. It can allow you to delay the launch of your book or release it right away. This helps to easily time the release with any launches you may have planned. Just leave it blank if you want it to be available immediately upon approval. Click "Save and Continue" to move onto the next step or just "Save" to save the content for later. 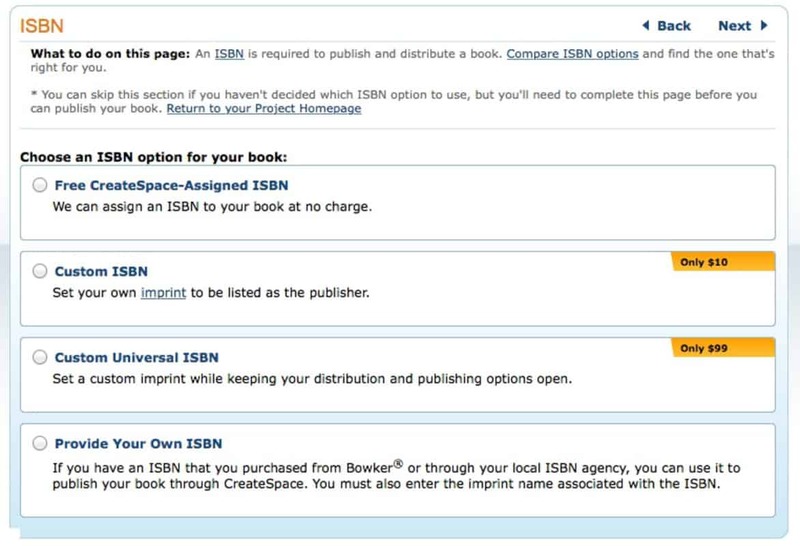 The ISBN page allows you to choose the ISBN option you want to use. 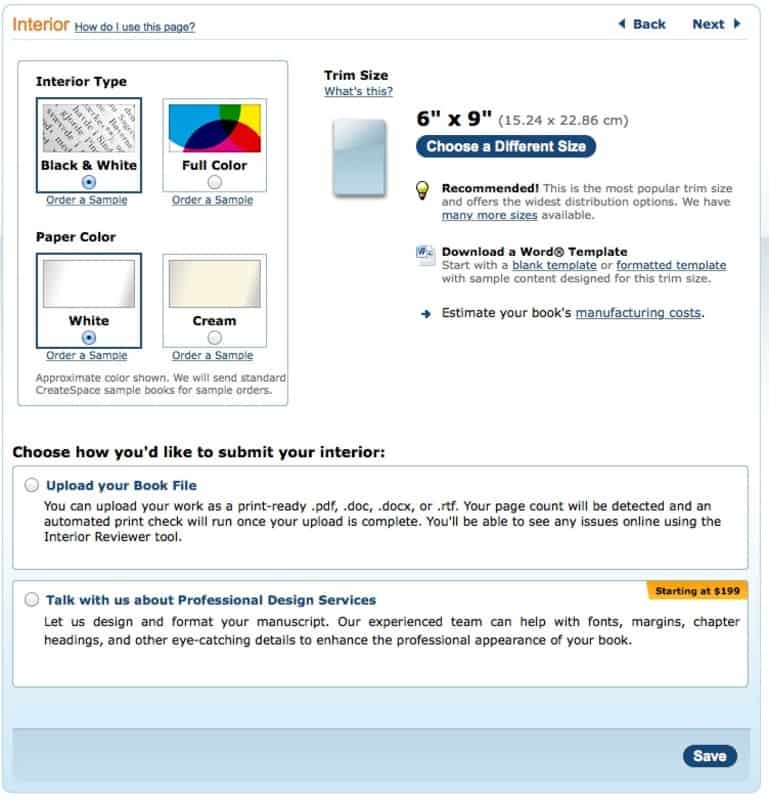 You can use a CreateSpace ISBN, create a custom one, or use one of your own. We highly recommend you provide an ISBN of your own, this keeps your distribution options open, allows you to be the publisher, and removes some stigma that publishing through CreateSpace can cause. You can read a more detailed explanation of what is an ISBN and our recommendations for handling it. 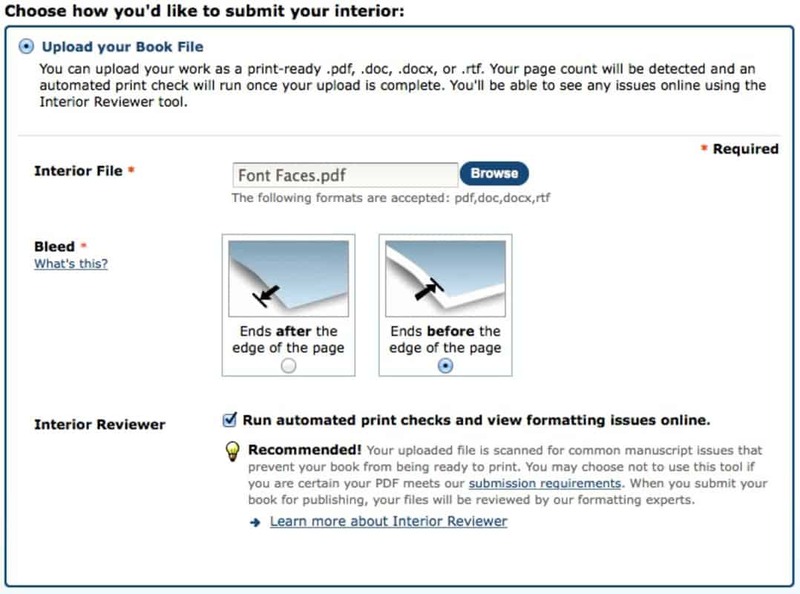 The interior step walks you through uploading your interior PDF and setting your trim options. Choose "Black and White" or "Color", depending on how you want your book printed. This only affects the inside, the cover will always be in color. Also choose the paper color you prefer. We use "White" for all of our books but some people prefer "Cream", especially for books that aren't picture heavy. The trim size is the dimensions of the book. Pick whatever trim size you designed your book around. Upload your interior file that you created earlier using the "browse" button. Choose the bleed that you wanted to go with. We recommend leaving "Run automated print checks and view formatting issues online" checked because it never hurts to have your work double checked. Click save to upload your file and move on. The type of cover you want is completely up to you. Glossy covers are more shiny and bright while matte covers are flatter and a little more subdued. 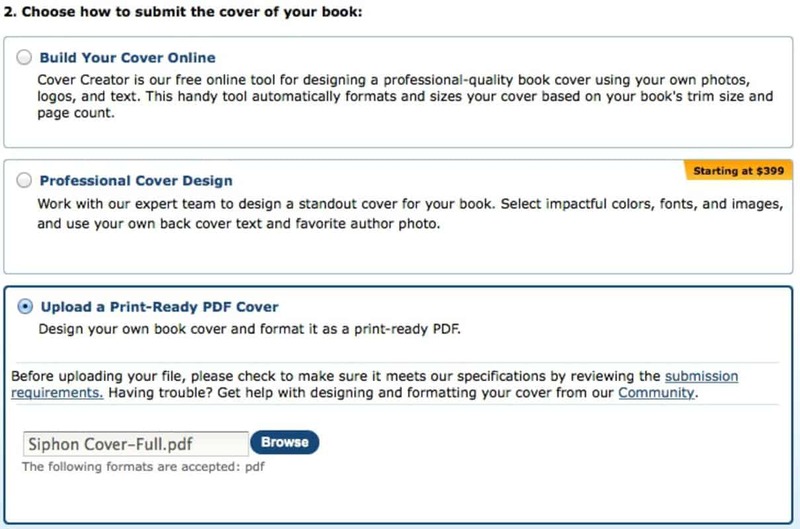 If you have already designed your cover, click on the "Upload a Print-Ready PDF Cover". Click "Browse" and choose the PDF cover file you exported. Click "Save" to upload the cover. Once it uploads successfully, click "Continue" to move on. Once your files have been approved by CreateSpace you will need to view and approve a proof. You have two options for this, view an online proof or have them ship you a proof to view. If it is your first book, we highly recommend using both methods. First, use their online proofing tool to make sure there is nothing major you see wrong. If it looks good, have them send you a proof to view. Now that I've been through the process several times, I check and approve the online proof. Then as soon as it comes up on Amazon, typically in a day or two, I order a real copy of the book and pay for the overnight shipping. I have Prime so it only costs a few bucks. I get the print copy in the mail before it actually hits the search results and can un-post the book if there is something wrong. 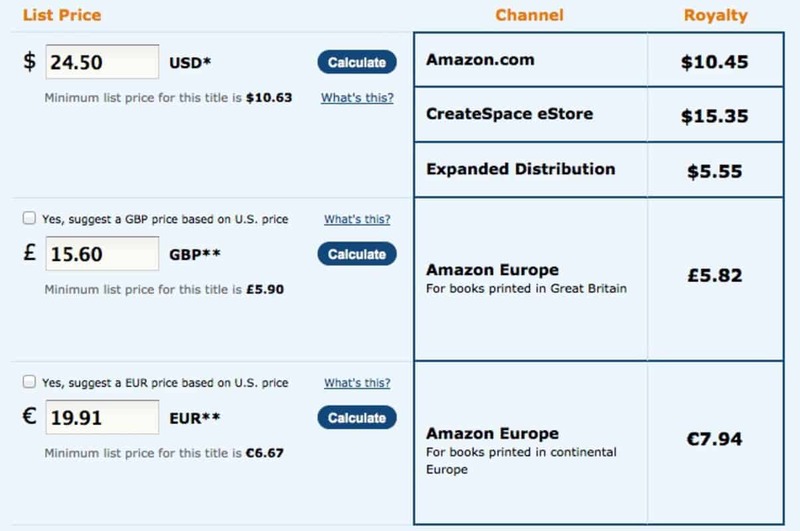 The channels you choose will determine where Amazon distributes your book. We recommend always using them for Amazon.com, Amazon Europe, and CreateSpace eStore. If you want ease of distribution then using the Amazon Expanded Distribution options work well but if you want to have the widest distribution, using IngramSpark is often the way to go. Enter in the price of your cookbook then click "Calculate" to see what your royalty will be in various channels. To fill out your other prices you can enter a specific number or use the "Yes, suggest a price based on U.S. price" checkbox for an equivalent price. 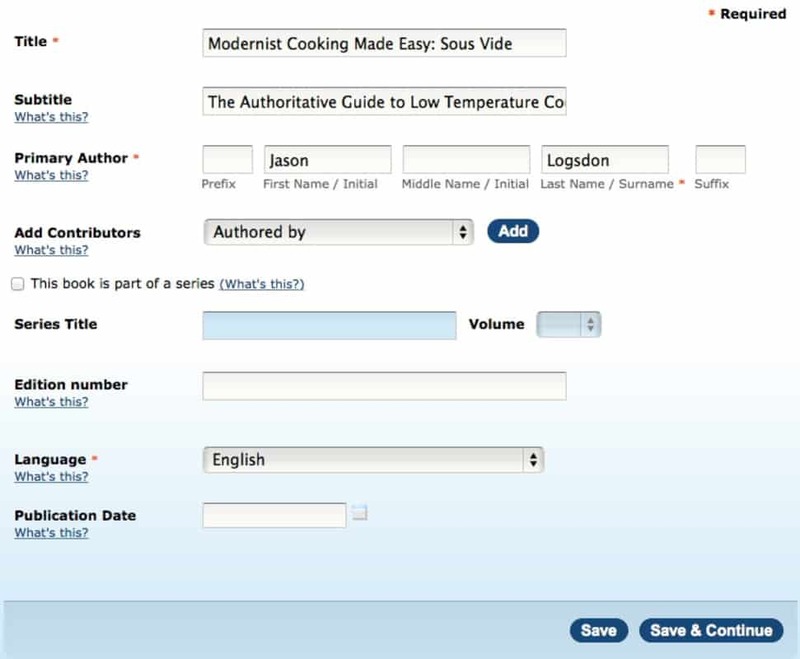 The description page collects information that controls how and where your cookbook appears on Amazon. Paste in the cookbook description you created earlier. 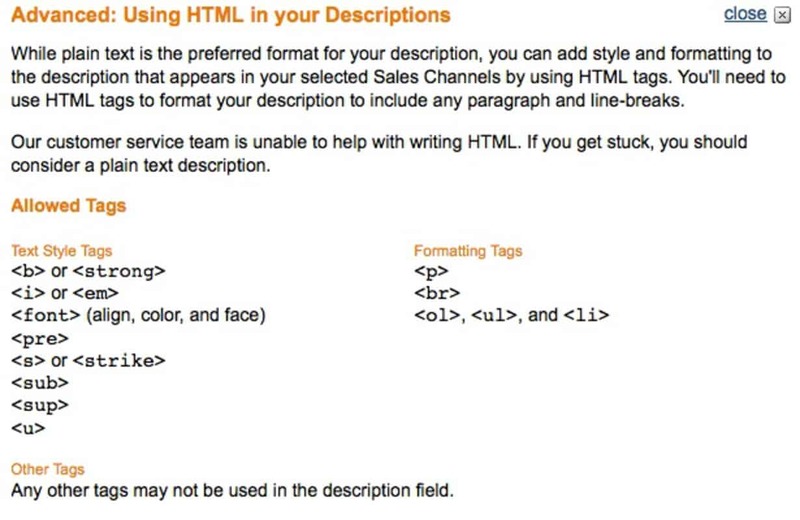 For CreateSpace you can use some HTML formatting including font size and faces, bold, italic, super and sub script, ordered lists and unordered lists. 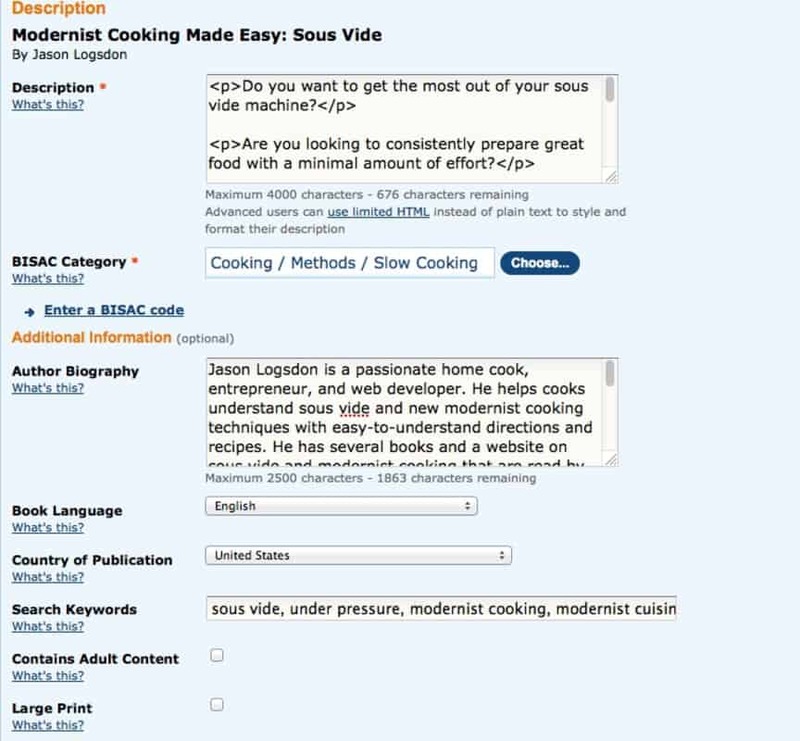 The BISAC Category is the place that your cookbook will show up in the Amazon hierarchy. You can learn more about choosing Amazon categories. 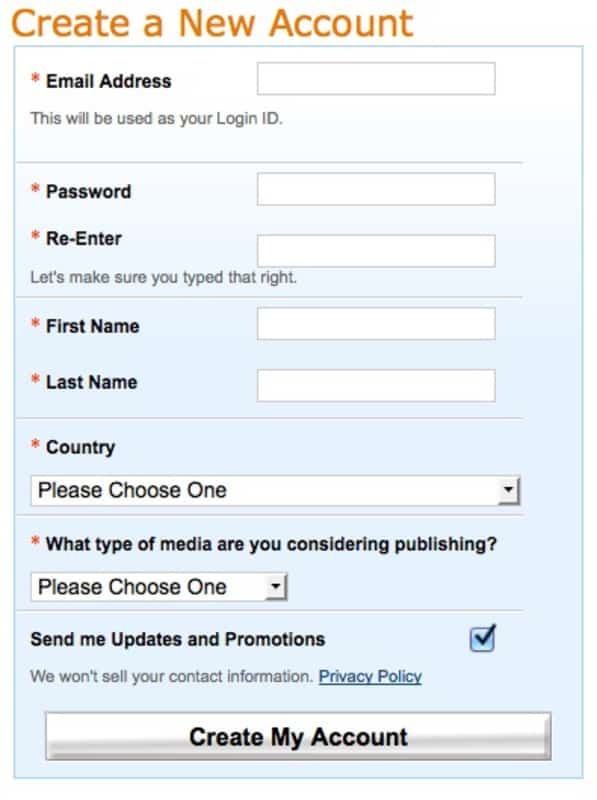 Choose the country you are publishing from and that is listed with your ISBN number. Enter in the Amazon keywords you came up with before. You can add up to 5 keywords. If your cookbook contains content not suitable for children then be sure to click this. If this version of your cookbook is a "large print" version, check the checkbox. Once you have all of the previous information entered, as well as a proof ordered and approved, you are ready to publish! Just click the "Publish" button and your book will be made available on Amazon is a few days. You can get a sneak look at your book the instant it goes live from: //www.amazon.com/gp/product/XXXXXX/ - where "XXXXX" is your ISBN-10 digit number. Your book will show up here before it shows up in any search results or other Amazon pages, usually in 1 to 2 days. You can also use this url when building any launch pages on your blog.